In the heart of Snake Den, is a working farm run by several generations of the Dame Family. The Dame Family Farm buildings have been placed on the National Register of Historic Places and restored to the period in which they were built (ca. 1760's through 1925.) The farm is a living museum, open to the public by appointment only and dedicated to the preservation of the rural way of life, of a time when the farmer lived in harmony with the land and its inhabitants. The Rhode Island Department of Environmental Management has developed educational displays; natural trails have been provided with the aid of the Audubon Society of Rhode Island and the Rhode Island Historical Farm Inc.
Dame Farm is the functional and visual focal point of approximately 500 acres of farm land-woodlots, orchards, pasture land and fields--in the rolling countryside along Brown Avenue. As one travels along the road, the buildings, fields and activities of the farm are presented in ever changing aspect. The barn, sheds, and dwelling, set well back from the road, form a compact nucleus surrounded by fields where hay, corn, and vegetables are grown. 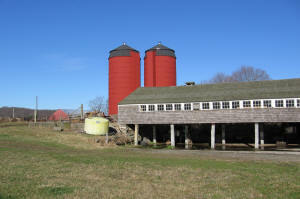 Dame Farm has supplied diversified crops to the local market for at least a century and a quarter and it recalls a part of Rhode Island life which is rapidly disappearing--the moderate sized family farm, owned and worked by generations of old-line Yankee farmers which provided food for the state's cities and towns during the nineteenth and twentieth centuries.